› Opportunity has switched to a new version of its flight software, with plans for flash memory reformatting. 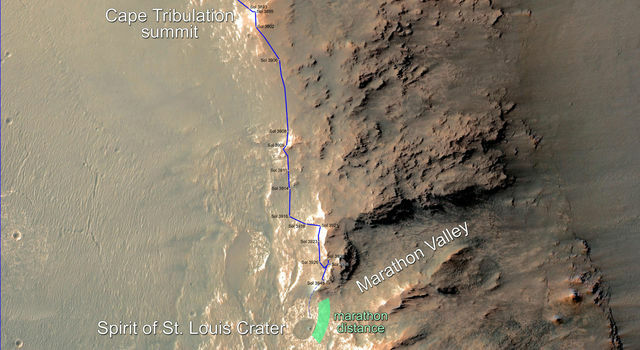 NASA's Mars Exploration Rover Opportunity climbed last month to an overlook for surveying "Marathon Valley," a science destination chosen because spectrometer observations from orbit indicate exposures of clay minerals. Near the overlook, it found blocky rocks so unlike any previously examined on Mars that the rover team has delayed other activities to provide time for a thorough investigation. "We drove to the edge of a plateau to look down in the valley, and we found these big, dark-gray blocks along the ridgeline," said Opportunity Project Scientist Matt Golombek of NASA's Jet Propulsion Laboratory, Pasadena, California. "We checked one and found its composition is different from any ever measured before on Mars. So, whoa! Let's study these more before moving on." The first rock checked at the site has relatively high concentrations of aluminum and silicon, and an overall composition not observed before by either Opportunity or its twin rover, Spirit. 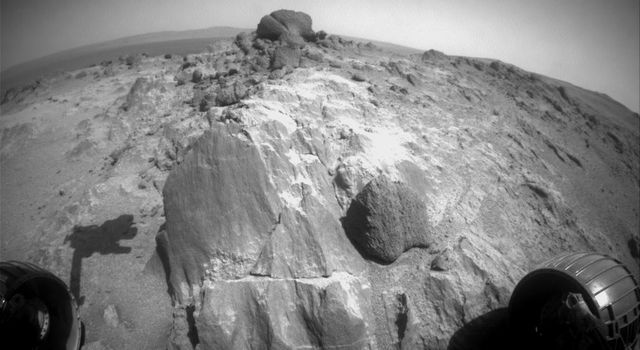 This was determined by examining the rock, called "Jean-Baptiste Charbonneau," with the Alpha Particle X-ray Spectrometer instrument on the end of Opportunity's robotic arm. The next target rock at the site is called "Sergeant Charles Floyd." The team's target-naming theme in the area is from the Lewis and Clark expedition. Although the rocks are gray, the visible-light spectrum of the Charbonneau type has more purple than most Mars rocks, and the spectrum of the Floyd type has more blue. Of the two types, the bluer rocks tend to lie higher on the ridge. 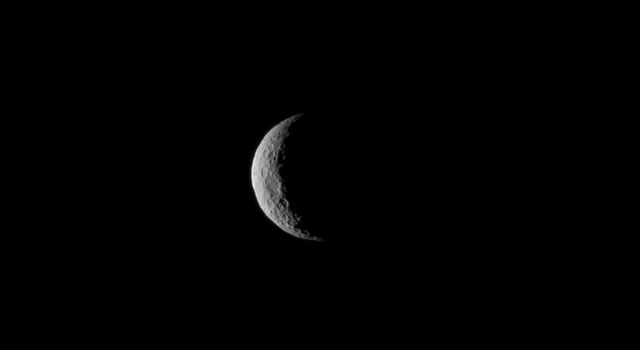 Actions to restore use of Opportunity's non-volatile flash file system will resume after inspection of the rocks on this ridge. Due to recurrent problems with the flash memory, including "amnesia events" and computer resets, Opportunity has been operating since late 2014 in a mode that avoids use of the flash memory. Between the stops at Charbonneau and Floyd, the rover team uploaded to Opportunity a new version of the rover's flight software. The new version is designed to use only six of the rover's seven banks of flash memory. It will avoid the seventh bank, known to be a problem area. The rover is using the new software, but a memory reformatting will be needed before resuming use of flash memory. After reformatting, the operations team will avoid use of the rover's arm for several days to make sure the flash file system is fixed and no longer causes resets. 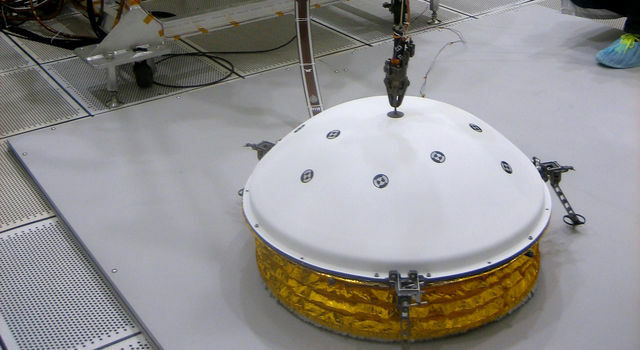 A reset during the use of the rover's arm would require a complex recovery effort. As of March 5, Opportunity has driven 26.139 miles (42.067 kilometers) since it landed on Mars in January 2004. This brings it within 140 yards (128 meters) of reaching the distance of a marathon footrace.